Visited the new American Wing at the Metropolitan today to pay homage to Edith and Newton in all their glory. They looked great. Mr. and Mrs. I.N. Phelps Stokes was not exactly causing a stir but I did notice some wise people going up and admiring it. On the other hand, the painting suffers by proximity to Sargent’s so-popular Madame X. Two young men pull up behind me as I admire her lavender shoulders. “This is IT,” says one. I’d like to hear that said of Edith, with her preternatural glow and straight-shooting gaze. Maybe when people read Love, Fiercely (out six weeks from now) someone will say that. In any case, dwarfing both canvases and hung between them is Sargent’s gargantuan doily of a painting that depicts the three Wyndam sisters. 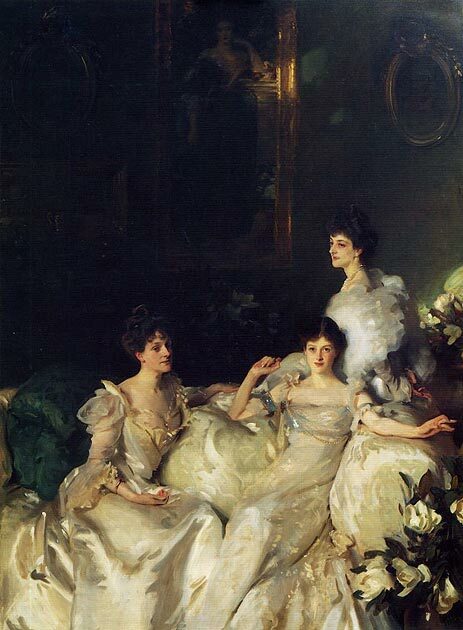 It gives an idea of how female perfection was conceived at the end of the 19th century, white and light and delicate. Take another look at Edith to see how vastly different she is. Instead of chiffon, cotton pique. No lavish peonies. A boater! A bow tie. Revolution comes to Gilded Age America.